Phoenix constellation lies in the southern sky. It was named after the phoenix, the mythical bird that rises from its own ashes. The constellation was originally introduced by the Dutch astronomer and cartographer Petrus Plancius from the observations of the Dutch navigators Frederick Houtman and Pieter Dirkszoon Keyser in the late 16th century. It is a relatively small constellation, but it is the largest among the 12 constellations created and named by Plancius. It was first depicted on his globe in 1598 and later appeared in Johann Bayer’s atlas Uranometria in 1603. Phoenix constellation is easy to see for anyone in Australia and South Africa during southern hemisphere summer, but generally can’t be observed by anyone living north of the 40th parallel, and lies pretty low in the sky for observers north of the equator. Phoenix contains several notable deep sky objects, among them the Phoenix Cluster of galaxies, the black hole candidate HLX-1, and Robert’s Quartet, a compact galaxy group. Phoenix is the 37th constellation in size, occupying an area of 469 square degrees. It is located in the first quadrant of the southern hemisphere (SQ1) and can be seen at latitudes between +32° and -80°. The neighboring constellations are Eridanus, Grus, Fornax, Hydrus, Sculptor and Tucana. Phoenix belongs to the Johann Bayer family of constellations, along with Apus, Chamaeleon, Dorado, Grus, Hydrus, Indus, Musca, Pavo, Tucana and Volans. Phoenix contains five stars with known planets and does not have any Messier objects. The brightest star in the constellation is Ankaa, Alpha Phoenicis, with an apparent magnitude of 2.40. There is one meteor shower associated with the constellation, the Phoenicids, which occurs around December 5 every year. The mythical bird phoenix is known as the sacred fire bird across many mythologies: Greek, Persian, Arabic, Egyptian, Roman, Turkish, Indian and Chinese among others. The phoenix was said to have resembled an eagle with purple, red and gold feathers, and a scarlet and gold tail. Ovid wrote in his Metamorphoses that the bird lived for 500 years. When it reached the end of its life span, the phoenix would build itself a nest at the top of a palm tree, using incense and cinnamon bark, then ignite the nest and die in the fire. A new bird would be born from its father’s body and, according to legend, when the young phoenix was strong enough, it would take the nest and carry it to the temple of Hyperion, who was one of the 12 Titan deities and the lord of light. In another version of the tale, the young phoenix would embalm the ashes of the dead one in an egg made of myrrh and carry the egg to the Egyptian city Heliopolis. The name Heliopolis means “sun city” in Greek. Ankaa is the brightest star in the constellation. Its name comes from the Arabic al-‘anqā’, which means “the phoenix.” It is also sometimes known as Nair al-Zaurak, or “the bright star of the skiff” (an-na’ir az-zawraq in Arabic). Alpha Phoenicis is a spectroscopic binary star approximately 85 light years distant. The system has the combined stellar classification K0.5 IIIb and a combined apparent magnitude of 2.377. The two components in the system orbit each other with a period of 3848.8 days (or 10.5 years). The primary star, as the spectral class indicates, is an orange giant. Beta Phoenicis belongs to the spectral class G8IIIvar. It has a visual magnitude of 3.32 and is approximately 198 light years distant from the solar system. Beta Phoenicis is the second brightest star in Phoenix. Like Ankaa, it is a binary star. It is composed of two class G8 yellow giants with an apparent magnitude of 4.0 and 4.1. The two stars orbit each other with a period of 168 years. Gamma Phoenicis is star of the spectral type M0IIIa, which is to say, it is a red giant. The star has a visual magnitude of 3.41 and is about 234 light years distant. Gamma Phoenicis is a variable star, with magnitude variations from 3.39 and 3.49. Kappa Phoenicis is located relatively close to Ankaa. It is a main sequence star of the spectral type A5Ivn. It has an apparent magnitude of 3.90 and is about 77 light years distant from the Sun. Zeta Phoenicis is an eclipsing binary star classified as an Algol-type variable. Its visual magnitude varies between 3.9 and 4.4 over a period of 1.66977 days. Zeta Phoenicis is really a four star system. It has two other dim components with a visual magnitude of 7.2 and 8.2 located 0.8 and 6.4 arc seconds away from the primary star. The system has the stellar classification B6 V + B9 V. It is approximately 300 light years distant. Nu Phoenicis is a main sequence dwarf of the spectral type F8 V. It has an apparent magnitude of 4.96 and is only 49.3 light years distant from Earth. The star is similar to the Sun, but it is slightly more massive and luminous. It is believed to have a dust ring that extends several astronomical units from an inner edge that starts at 10 astronomical units. SX Phoenicis is a variable star in Phoenix that serves as a prototype for a group of stars known as the SX Phoenicis variables. These stars belong to spectral classes in the range A2-F5, they vary in magnitude by up to 0.7, and exhibit short period pulsation over periods of 0.7-1.9 hours (0.03-0.08 days). They generally have lower metallicity than the Sun, a relatively high space velocity, and low luminosities relative to their stellar classification. They are mostly found in galactic halos and globular clusters. All SX Phoenicis variables located in globular clusters are blue stragglers, stars that have a higher temperature and as a result appear bluer than the main sequence stars in the same cluster that have similar luminosities. HE0107-5240 is one of the most metal-poor stars known in the Milky Way. It has only 1/200,000 of the metal that the Sun has. The star’s low metallicity indicates that it is one of the oldest Population II stars to have formed. Population II stars are metal-poor stars that formed during an earlier time of the Universe and are believed to have created all the other elements in the periodic table other than the more unstable ones. If the star was completely metal-free, it would belong to Population III, the hypothetical, extinct first generation of stars. HE0107-5240 has a visual magnitude of 15.86 and is approximately 36,000 light years distant. It was discovered during a survey for faint quasars with the 1m ESO Schmidt telescope, conducted by Norbert Christlieb and colleagues at the University of Hamburg. Gliese 915 is a degenerate star, a white dwarf, located only 26.7 light years from the solar system. It is believed to be the 11th nearest white dwarf to the Sun (possibly 9th, 10th or 12th). It has a visual magnitude of 12.76. Robert’s Quartet is a compact group of galaxies in Phoenix, approximately 160 million light years distant from the Sun, with a combined visual magnitude close to 13. The galaxies in the group are NGC 87, NGC 88, NGC 89 and NGC 92. They are located within an area spanning 75,000 light years. The four galaxies are in the process of colliding and merging. They were first discovered by the English astronomer John Herschel in the 1830s. 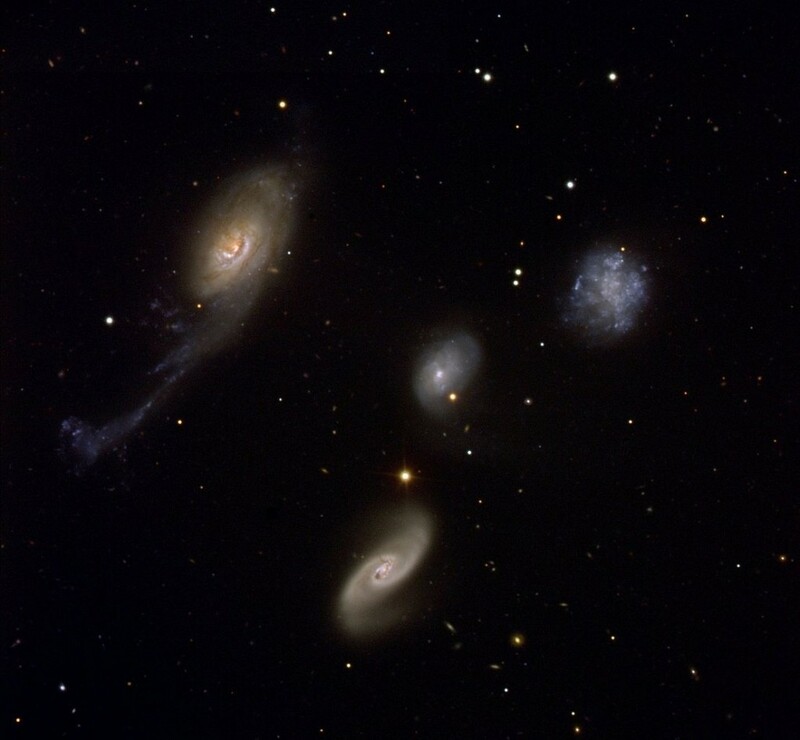 Robert’s Quartet was named by the astronomers Halton Arp and Barry F. Madore, who compiled A Catalogue of Southern Peculiar Galaxies and Associations (1987). The largest galaxy in the group is NGC 92, with an apparent magnitude of 13.8. It is a spiral galaxy with an unusual appearance: one of its spiral arms contains a large amount of dust and has been distorted by interactions with the neighbouring galaxies. The galaxy contains over 200 regions of active star formation. NGC 87 has a visual magnitude of 14.1. It is a barred irregular galaxy. It contains at least 56 regions where active star forming activity takes place. NGC 88 is a spiral galaxy with an apparent magnitude of 14.1, and NGC 89 is also a spiral galaxy. It has a visual magnitude of 14.2. NGC 625 is a barred spiral galaxy. It is about 12.7 million light years distant and has an apparent magnitude of 11.7. The galaxy is a member of the Sculptor Group, a loose group of galaxies located near the south galactic pole in the constellations Sculptor and Cetus. HLX-1, or Hyper-Luminous X-ray source 1, is a proposed intermediate-mass black hole in the galaxy ESO 243-49. It is believed to be a galactic remnant of a dwarf galaxy that was absorbed by ESO 243-49 after a galactic collision. HLX-1 was first discovered in November 2004 and became a black hole candidate in 2009. The Phoenix Cluster is one of the most massive galaxy clusters known. It is showing star forming activity at the highest rate ever recorded in a galaxy cluster, with the recent creation of 740 solar masses per year. The cluster is also emitting more X-rays than any other known massive galaxy cluster. The central galaxy in the cluster contains large amounts of hot gas. There is a supermassive black hole at the core of the system that is growing very rapidly, and expanding at an approximate rate of 60 solar masses per year. Currently it is 20 billion times the mass of the Sun.